A Somalian headrest with a crescent-shaped upper platform rising from a small oval base by means of two flattened supporting columns with a subtle chamfer to the inner side. 20th century. Boni tribe. Headrests are used by both Somali men and women while resting or sleeping. It is popularly believed that the headrest serves a protective function by elevating the head off the ground during sleep, thereby preventing any possible attack by snakes or scorpions. Men's headrests, such as this one, generally feature a smaller base that makes them somewhat unstable to sleep on, while the rectangular bases of women's headrests are usually more stable. Scholars suggest that this instability is purposeful as it prevents the user from falling into a deep sleep while guarding the herds at night. 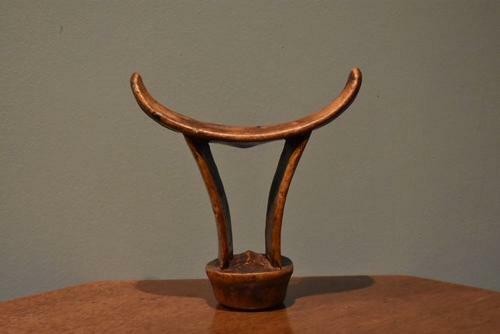 It is in this sense that the headrest itself has become a symbol of vigilance among Somali nomads. Headrests also play an important role in the nuptial ceremonies of Somali nomads. On his wedding night, the groom places the tubash (a sum of money) under the bride's headrest. The morning after the marriage is consummated, the bride will use this money to purchase an amber necklace, the symbol of her new status. Somali nomads also make use of another type of headrest with a single cylindrical supporting column. It appears that the different styles are for men of different status, with the single-columned variety for young men and the double-columned variety, as seen here, reserved for elders.